"The space ship Starfinder is taking two dangerous criminals for trial on Earth. En route, they crash through a meteor storm and have to make an emergency landing on Skaro – the planet of the dreaded Daleks. But Captain Redway and his faithful crew don’t anticipate any trouble. After all, the Daleks were defeated fifty years ago and now they are completely inactive. 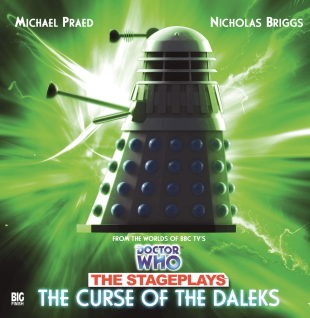 But when a crate full of mysterious devices is discovered and the Daleks start to come back to life, it becomes clear that there is a traitor amongst the Starfinder’s crew… A traitor intent on reactivating the power of the Daleks!" So, I guess this was the best of the stageplay adaptions, but that doesn't mean much. Overall, just another Dalek adventure. I think the presence of the Doctor would have helped this, but at the end of the day, it was just sort of a run of the mill story. Honestly if I'd paid to go see a Doctor Who stageplay, I would have be disappointed by either of these three. There's nothing really exceptional about the characters or stories to make them appealing to fans of the show. I agree, this was the best of the stageplays but still amongst the weakest of the marathon. This one felt like it could be a play more than any of the others. The conspiracies, the accusations at the beginning could make for good theatre. Yet, you're right. I didn't find any of the characters that interesting. Oddly I liked the narrator the most. That's probably not a good thing. Also the sexism subplot was just awful.